Springboard your career with this fully funded opportunity. Are you sitting on an amazing design portfolio? Or perhaps your studio is overflowing with incredible pieces of art? If so, creativehub wants to hear from you for its free to enter, open-call competition, the Ultimate Solo Show. 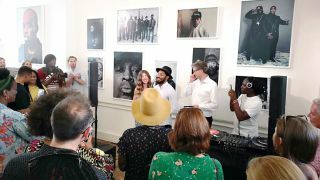 Illustrators, graphic artists and photographers are all eligible, with the winner receiving a fully funded, large-scale exhibition at theprintspace's Shoreditch Gallery. This is a potentially career-changing opportunity for an artist, and the good news is that creativehub is looking for unexhibited artworks from everyone including emerging, mid-career and professional creatives of any discipline, regardless of the artist's theme or style. If you're interested in taking part, creativehub is looking for "exciting, original, and unexhibited work that forms a single coherent series". Hopeful artists should submit between 8-20 images of their most accomplished work along with a short project description. People could be admiring your work! You can enter until 21 October. Work will be judged by Niall Flynn of Huck Magazine, Kate Edwards of The Guardian and Tom Robinson of Handsome Frank, so be sure to bring your A-game. Reckon you've got what it takes? To enter, simply head over to the Ultimate Solo Show competition page, set up an account, upload your work and follow the submission instructions. After the open call has closed, a shortlist of 10 artists will be chosen by the judges. Each artist will then receive their own online art store and the public will decide on the overall winner via print purchase; so the store that sells the most wins. Exhibiting work in a London gallery is a dream come true for artists, so why not turn your aspirations into reality by entering? Good luck!